RCIA teams often struggle with getting catechumens and candidates to participate regularly in the church's liturgy. Those who do often feel bored or confused, or they see it as a nice tradition or an inconvenient obligation rather than the heart of our Catholic faith. So we fill the gap with more catechesis that explains the liturgy to seekers, and we pray they will have a better personal experience on Sunday. Yet neither causes them to love the liturgy as we do. 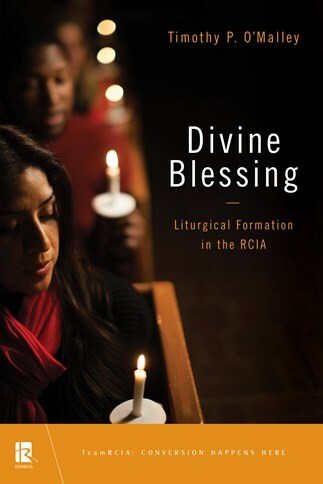 In Divine Blessing: Liturgical Formation in the RCIA, Timothy P. O'Malley shows us how we can break out of a classroom model about liturgy and instead invite seekers to be formed by the Risen Christ through the liturgy. This book will give you a process for preparing your catechumens and candidates to learn the liturgy's symbolic language of self-giving love that will sustain them with divine blessing and train them to be Christ's disciples in the world. Timothy O'Malley, PhD, is director of the Notre Dame Center for Liturgy in the Institute for Church Life and a concurrent assistant professional specialist in the Department of Theology, University of Notre Dame. He is the author of Liturgy and the New Evangelization: Practicing the Art of Self-Giving Love published by Liturgical Press. Divine Blessing: Liturgical Formation in the RCIA is a "must read" for all those who are seeking to enliven and animate new or existing Catholics in their faith. Dr. Tim O'Malley has written a scholarly yet accessible book replete with Scriptural references and relatable stories shared with honesty, humor and insightfulness. His depth of wisdom, love for the liturgy, and recovery of the aesthetic sense of sacramentality in the Church is an inspiring challenge to all. I am fascinated by what Timothy O'Malley has done in this book, espousing Luigi Giussani's visionary insights to the RCIA process. How can the Christian initiation process provoke a deeper desire for God? How can the catechumenate propose a more human life anchored in Christ? How can catechumens verify the truth of this proposal so that they might respond by making a gift of their lives? O'Malley argues persuasively that not only is the RCIA inclined towards these questions, the liturgy itself forms us along this trajectory. This book is a must read for all those invested in the RCIA, but also for each of us who desires to truly live the Christian life.